Unit 10 - p2, m1, d1. I will be outlining types of quality care provided for looked after children and young people and how each provision meets all childrens needs. 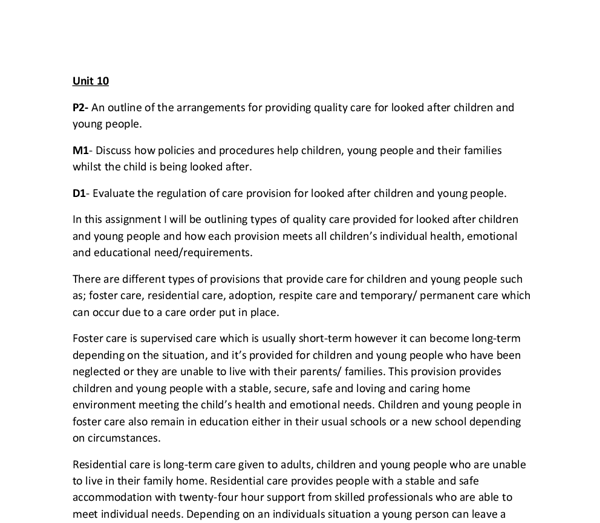 ﻿Unit 10 P2- An outline of the arrangements for providing quality care for looked after children and young people. M1- Discuss how policies and procedures help children, young people and their families whilst the child is being looked after. 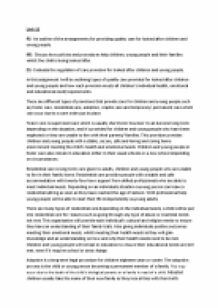 D1- Evaluate the regulation of care provision for looked after children and young people. In this assignment I will be outlining types of quality care provided for looked after children and young people and how each provision meets all children?s individual health, emotional and educational need/requirements. There are different types of provisions that provide care for children and young people such as; foster care, residential care, adoption, respite care and temporary/ permanent care which can occur due to a care order put in place. Foster care is supervised care which is usually short-term however it can become long-term depending on the situation, and it?s provided for children and young people who have been neglected or they are unable to live with their parents/ families. This provision provides children and young people with a stable, secure, safe and loving and caring home environment meeting the child?s health and emotional needs. Children and young people in foster care also remain in education either in their usual schools or a new school depending on circumstances. ...read more. Every child matters (2003) is a legislation put in place to promote the well-being of all children and young people regardless of their ethnicity, background culture or circumstances which is shown that all children should be healthy, stay safe, enjoy and achieve, make a positive contribution and experience economic well-being. This is also promoted for looked after children as the children?s commissioner was put in place to give children/ young people an input in government decisions. This legislation states all organisations working with children and young children need to protect children from harm and assist them in achieving goals and heart desires. The children Act (1989) has been put forward to ensure the welfare of every child, teaching and giving parents an understanding on their responsibilities for the children which involves both the father and mother of the child and step-parents if involved. This Act promotes the wellbeing of children at all times and it also give parents/families an upper hand on how children and young people need to be looked after within all households, providing parents with ways and why children?s health, physical, emotional, intellectual and educational needs must be met. Safeguarding is promoted within households/families and all organisations working with children and young people as every child can be put at harm or at risk of abuse regardless of their gender, age or ethnicity which is one of many reasons, safeguarding has been put forward. ...read more. CQC helps encourage health and social care organisations to put individuals using the service at the heart of its work regardless of cultural differences. This regulator has set national standards to reinsure service users on the service they are expected to receive which is done by monitoring and inspecting the services. CQC ensures all organisations take individuality into account by making sure organisations protect the rights of vulnerable people, such as children and young people. CQC is ensures children, young people and their families the insurance that the quality of their care will be to a high standard and to their required needs, working from the Human Right Act (). The Care Quality Commission is structured around legislations, policies and procedures such as Human Right Act, Data Protection Act and many more Acts as it a guideline on individuality and entitlements. It?s important for the Data Protection Act and confidentiality to be promoted within this organisation because personal information is required when reserving services and service users need to know their information is safe, which covers part of their Human right entitlements. BIBILOGRAPHY * Stretch B, Whitehouse M (2010) Health and social care level three book 1 BTEC national. Oxford Pearson. * Stretch B, Whitehouse M (2010) Health and social care level three book 2 BTEC national. Oxford Pearson. * www.legislation.gov.uk/ukpga/1989/41/contents * http://www.nhs.uk/NHSEngland/thenhs/healthregulators/Pages/carequalitycommission.aspx * https://www.gov.uk/government/organisations/ofsted ...read more. This student written piece of work is one of many that can be found in our AS and A Level Healthcare section. Informing their parents as to what is happening helping them to keep in contact with family and friends 3. Ensure that their carers meet their health, educational and social needs 4. Inform their carers about the child?s culture, religion and language 5. Data protection act 1998 ? this is to make sure that documents and personal information and kept personal. It also make sure that only relevant information is held electronically and that is isn?t held no longer than needed, for example if someone has passed away, their allergies don?t need to be recorded any longer. Covers mental illness as well as physical conditions Race relations act 1976 1. Made on the grounds of race, colour, nationality, ethnic or national origin unlawful. 1. People should not receive less of a service because of the colour of their skin or what they believe in Human rights act 1998 1. Unfair discrimination can affect the individual?s work, education and life opportunities, which can lead to depression and negative behaviours and long term health problems. For example, if an individual was experiencing discrimination in any format from the receptionist at their doctor?s surgery they would feel disinclined to phone or go in for an appointment when they needed healthcare. You will need a minimum of five GCSEs at grade C or above, plus two or three A Levels or equivalent to get onto a degree course. To become a nurse, you need to have completed a degree in nursing. Looking for expert help with your Healthcare work? Principles of communication in adult social care settings.